Last week’s narrow loss to the Toronto Maple Leafs was the L.A. Kings’ first defeat of the season and sent bookmakers into a flurry. They have been quick to adjust their betting odds for just how the Stanley Cup is going to pan out when we get to the business end of the season next April. 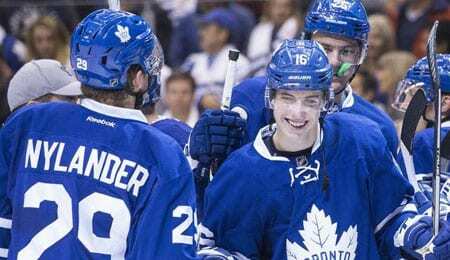 The Maple Leafs got off to the best possible start, with Mitch Marner showing flashes of his rookie form when he teed up Roman Polak for a blast deflected in by Matt Martin in the sixth minute of the first period (see video below). Tyler Bozak made it 2-0 late in the second, and although the Kings were quick to respond, the damage had been done and Toronto held on to complete a workmanlike victory. Where Will Fans be Placing Their Bets? The Kings started out the season being quoted at 20-to-1 by most online bookmakers to repeat the heroics of 2014 by ending the season as NHL champions and hoisting the Stanley Cup. Last week, those with an interest in NHL betting were starting to wish they had taken those odds when they were available, as the undefeated Kings got as short as 10-to-1 on some sites. Following the loss to Toronto, they have lengthened to around 15-to-1 again. But with plenty of time for all sorts of twists and turns, does that represent the most shrewd wager? Unsurprisingly, the Pittsburgh Penguins remain bookmakers’ favourites to finish the season on top for the third successive season. But last season, the victory was a hard fought one, and could so easily have gone the other way. Perhaps this is reflected in the 10-to-1 odds on offer, which shows what an open tournament it’s expected to be this season. What of last season’s beaten finalists, the Nashville Predators? They have got off to an indifferent start, but they have proved they have the experience and the confidence to go all the way, and the 15-to-1 odds on offer will surely look tempting to many fans. What’s Next for the Kings? The coming match ups will provide vital insights as to whether last week’s defeat was a temporary blip or if the Kings were playing over their heads in their opening games. On Tuesday, they snuck by (3-2 in a shootout) a buoyant Senators team, who blew away the same Maple Leafs on the weekend. Bookmakers saw the Senators as the warm favourites at around 5-to-7, but with the Kings at 6-to-5, it could have gone either way, so it was no surprise they couldn’t decide it after 65 minutes of play. Both teams were aware that the result offers a clearer indication of who is likely to have the fight to stay at the top of their game for a genuine playoff run, so fans, gamblers and even the other teams were likely watching this game with interest. The Kings now continue their Canadian trip on Thursday with a less pressurized visit to Montreal, where they take on the struggling Canadiens, before yet more road games next week against the Bruins and the Blues. If the Kings can win three of the next four match ups, bookmakers will be convinced that they are genuine contenders, and you can expect those odds to start sliding back down. Keep in mind that Montreal got whipped 5-1 in L.A. just over a week ago, so will desperately be seeking revenge on Thursday as it tries to work its way out of a large early season hole. Fantasy owners had to be thrilled to see defenseman Shea Weber get his first two-goal game as a Hab on Tuesday, giving him three tallies over the last four games. Now it’s your turn. Let us know in the comments below how you think the Kings will fare this season.